Cold chills. That’s what I get when I hear the eerie voice of Ralph Stanley. You can say that I’ve been a true blue Stanley Brothers nut since I first heard them in 1962. Just thumbing through my collection of LPs, I count 58 Stanley Brothers or Ralph Stanley albums, and that doesn’t include several bootleg CDs of live shows. Most of the albums have been played half to death. When I heard that Ralph had passed away earlier this week, I felt a deep sense of sadness. Of course, I started to think of all the Stanley Brothers songs I know. I stopped counting when I got to one hundred. 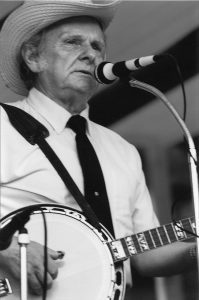 My favorite Ralph Stanley songs tend to be the lonesome variety. Sometimes it’s hard to figure out the most sorrowful song in the Stanley Brothers’ repertoire, because they are all pretty dang lonesome. One exception that comes to mind is “He Went to Sleep and the Hogs Ate Him.” That song is in a league all by itself! One of the more mournful songs that Ralph recorded was “I’ve Just Seen the Rock of Ages.” In the mid 1970s he frequently performed it with Keith Whitley singing lead to his chilling tenor. Larry Sparks did a classy version which showcased his own lonesome vocal chops. The story behind “I’ve Just Seen the Rock of Ages” is an amazing tale in itself. The composer of both the music and the lyrics was John Brenton Preston from Paris, Kentucky. Known as “the harmonica playing man,” Preston spent many years of his adult life behind bars, and his rap sheet was said to be rather long. While out on parole sometime in the 1970s, Ralph Stanley and Preston became acquainted and they traveled together to several festivals in Ralph’s bus. One time while they were on the road they stopped for lunch and Preston visited a western store that was next to the restaurant. The story goes that when he emerged from the store he was wearing a fancy pair of cowboy boots. Apparently, he neglected to pay for the boots, so he was in hot water again! During one period of incarceration, Preston landed in solitary confinement. As he sat on the cold, damp cement floor the inspiration for a song came to him, which turned out to be “I’ve Just Seen the Rock of Ages.” Afraid that he would forget the words, Preston found a tiny pebble, and he scratched the words right on to the cement floor. If that doesn’t conjure up the image of a lonesome song, I don’t know what does! When I first heard the story of this song and began to piece together some facts about the life of John Brenton Preston, I decided that I had to interview him. I spoke with David Freeman, owner of Rebel Records and publisher of the song. Dave guessed that Preston was still in prison, possibly in Kentucky. I immediately called the Kentucky Department of Corrections and they gave me the name of the prison where he was being held. When I rang the main number the operator transferred me directly to an actual cell block. The phone call itself was rather chilling. Listening past my conversation with the correction officer, I could hear the sounds of poisoners echoing off the high ceilings and the cold, icy bars. It didn’t take much for me to imagine being locked up there myself. Unfortunately, she told me that Preston had already been transferred to another facility. After several more attempts to track Preston down, the trail finally grew cold, and I wearied of the chase. I decided that John Preston did not want to be found. With the publisher’s permission, I did include a tab of “I’ve Just Seen the Rock of Ages” in my 2013 book Bluegrass Jamming on Banjo. In the preface of the song I included this message to Preston. “John Preston, if you’re reading this, please call me. I’d like to talk with you about this song.” Of course, I didn’t really expect to hear from him but now I know one reason why – he died at age 80 on September 3, 2013, right around the time the book came out. 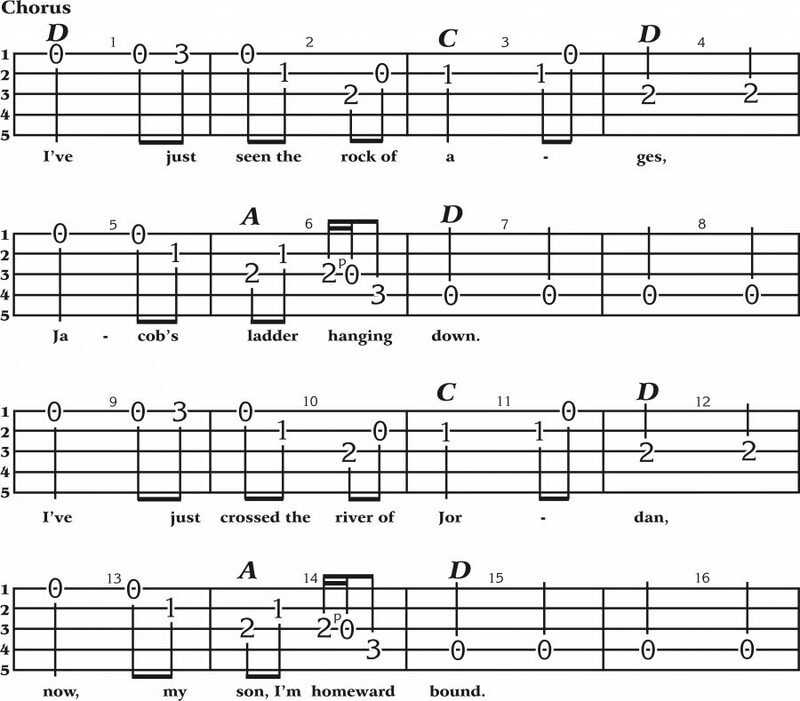 Below is a banjo tab of just the melody of “I’ve Just Seen the Rock of Ages” from my book Bluegrass Jamming on Banjo. Note that the banjo tuning is f#DGBD. The song can also be found both in tab and standard musical notation in two additional books in my Jamming series: Bluegrass Jamming on Fiddle and Bluegrass Jamming on Mandolin. Information on these and other instruction and song books for bluegrass and clawhammer banjo, fiddle, mandolin, guitar, dulcimer and ukulele, visit Wayne Erbsen’s website www.nativeground.com. Great song. Had no idea it was written by a convict. This is a question; I don’t know where else to ask it. I bought an ebook version of Bluegrass Banjo for Ignoramuses and wonder if there’s a way to listen to the music samples. I knew John Preston when I was young in the early 2000’s. He tried to show me how to play the guitar and was a family friend. He told me once that he wrote a song for ralph stanley while he was in prison. My boyfriend did not believe me when I told him I knew the guy who wrote this song, so I thought to look it up and find out if it was true – and it was! I remember John Preston as a one-legged man who always carried around an instrument to play, and you could always find him around Kelly Branch in Magoffin County KY. He was a good man, I did not know he passed. May he rest in peace.